Having enjoyed an unusually balmy July and August, we’re not quite ready to part with our flip-flops – are you? But with weather forecasters hinting at a possible Indian summer, it may be comforting to think that the arrival of autumn will be more of a gentle nudge as opposed to a sudden plunge into our winter wardrobes. But don’t get hung up on those post-holiday blues. Live a little and set your taste buds free with our daring ‘Go Spicy’ or ‘Go Cheesy’ inspired menus. Yes, you still have to commute. 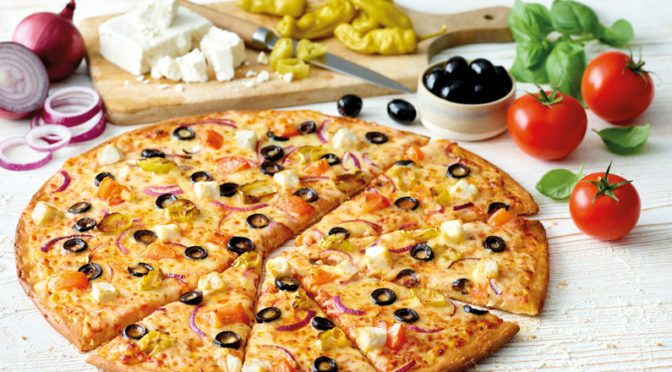 Yes, you still have to pick up the kids from school – but, you can certainly go wild where your pizza is concerned. If you’re still reminiscing about the scorching summer days, we’ve prepared our Tandoori Spice range of starters, mains and sides to warm up your palate and delight your senses. Delve into a double portion of authentically spiced tandoori chicken, served on our flaming phal sauce with paprika and crushed chillies. This is all topped off with crisp green peppers, red onions and freshly sliced tomatoes, then drizzled with cooling mint yoghurt raita. Make it a themed occasion and add some Tandoori Potato Wedges, Tandoori Chicken Wings and Tandoori Chicken Poppers to your order – then hold a family chilli challenge to see who can handle the heat. 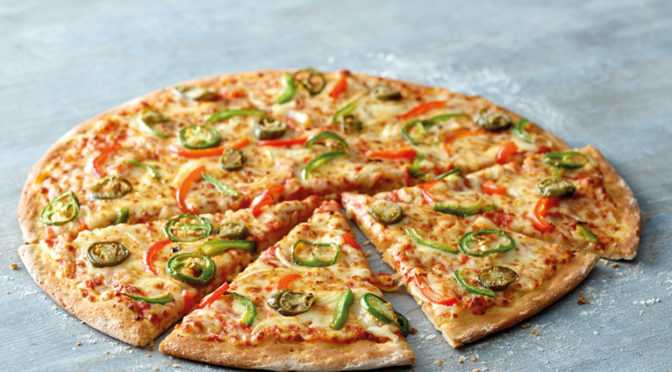 Speaking of chillies, our Spicy Chicken Burger pizza gets its kick from the aromatic Green Serenade chillies we source from our Bedfordshire based grower, Salv Genovese. In the small village of Blunham, the Genovese family has been doing something extraordinary for almost twenty years – growing millions of delectable chillies in the most unlikely of places. We really like Salv’s mould-breaking approach. But if hot and spicy isn’t your thing, don’t worry – we have cheese, lots of cheese. Our ‘Go Cheesy’ range comprises of a five Italian cheese blend from the foothills of the Apennines to an old monastery farm in the region of Lombardy. Doesn’t a Sausage & Pepperoni pizza, flanked by our Six Cheese Garlic Sticks and Six Cheese Potato Wedges, sound like the perfect Saturday night combo? Pizza fans will undoubtedly agree that more is always better when it comes to cheese. If you thoroughly enjoyed having your barbeque out almost every weekend these past few months, then the BBQ Meat Feast is for you. We’re all about that real southern taste, and there’s nothing quite like sinking your teeth into one of our spicy beef, sliced pepperoni, ham, pork sausage and crispy smoked bacon topped pizzas, complete with Kansas City style BBQ base sauce. 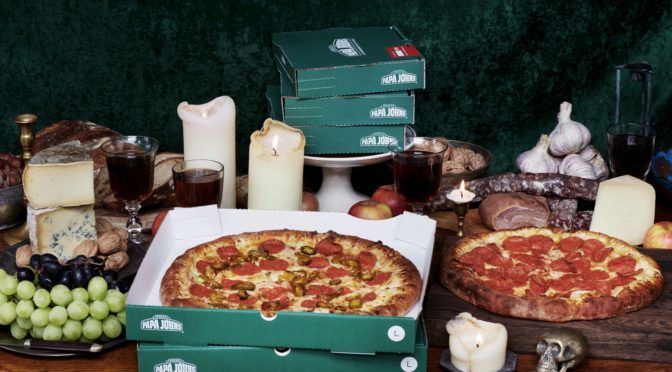 Next time you visit Papa John’s, we really hope that you’ll be feeling a little adventurous. Studies suggest that trying new things, even if it’s venturing towards something different on our pizza menu, can improve your mood – and let’s face it, most of us need a mood booster as winter approaches. So, be brave, have no regrets, and choose one of our impressive meal deals this season.